Hillary Clinton and Donald Trump can look forward to a presidential salary of $400,000 if they win in November. 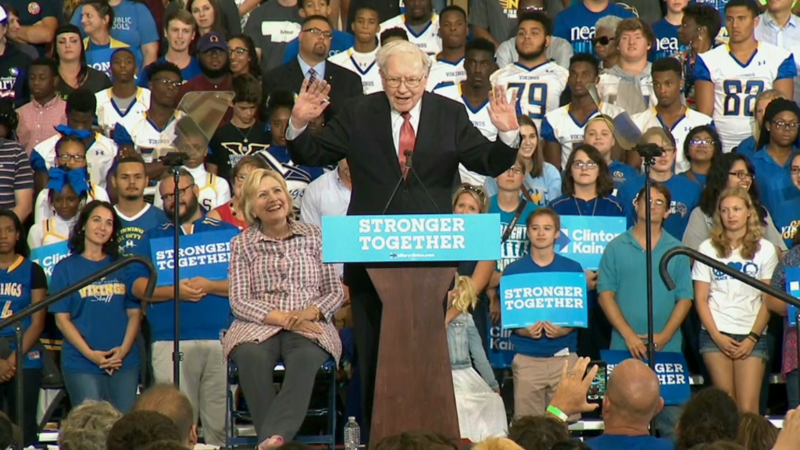 That's a fraction of their earning power -- Hillary and Bill Clinton banked $10.6 million mostly from speaking fees and royalties in 2015, while Trump said he made almost $560 million. But it's the best pay on offer for a major world leader. 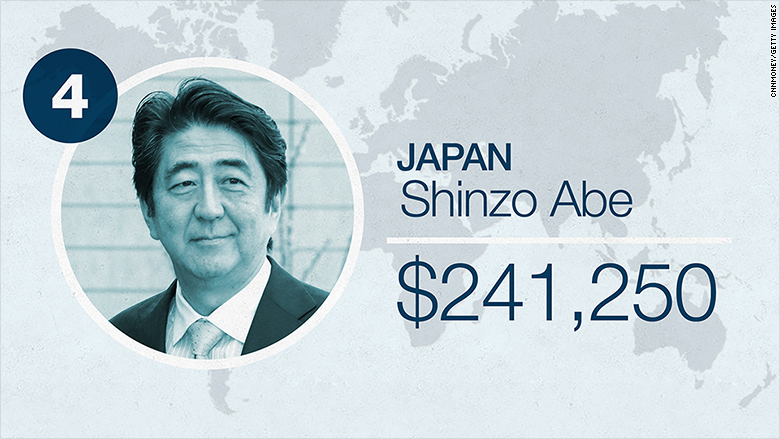 Here's how the pay of prime ministers and presidents of the world's biggest economies stacks up, according to official data and converted into U.S. dollars at market rates. President Obama leads the pack. 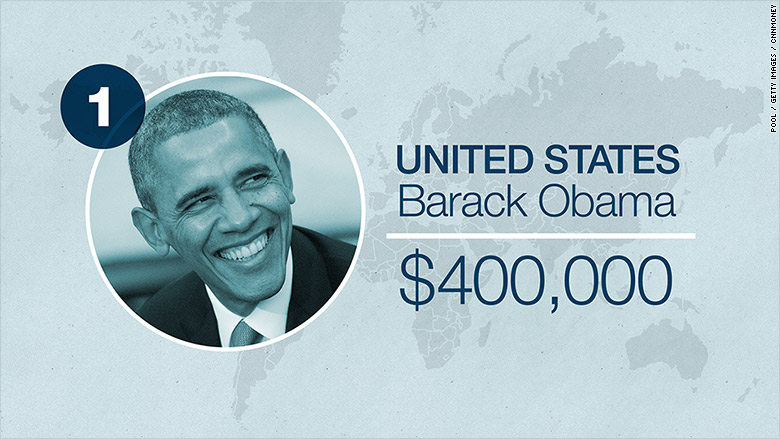 On top of the $400,000 a year, he gets a tax-free expense account worth $50,000. The salary was last raised by Congress in 2001. 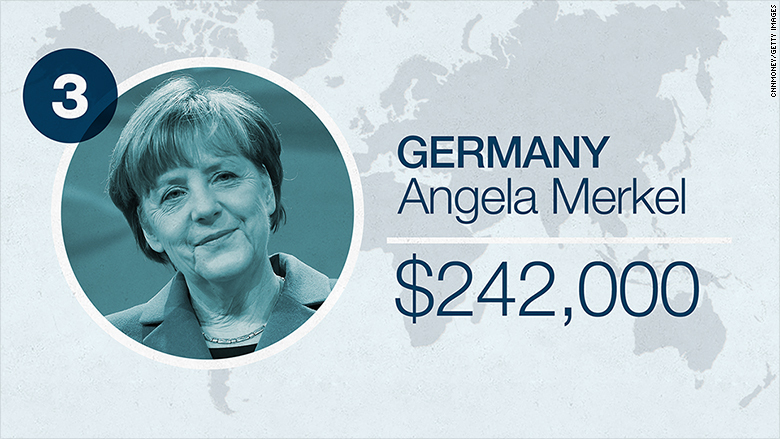 Angela Merkel's salary as German chancellor is set at 218,400 euros a year ($242,000). The chancellor got a 2% pay rise at the beginning of March, and will get another 2% next February. 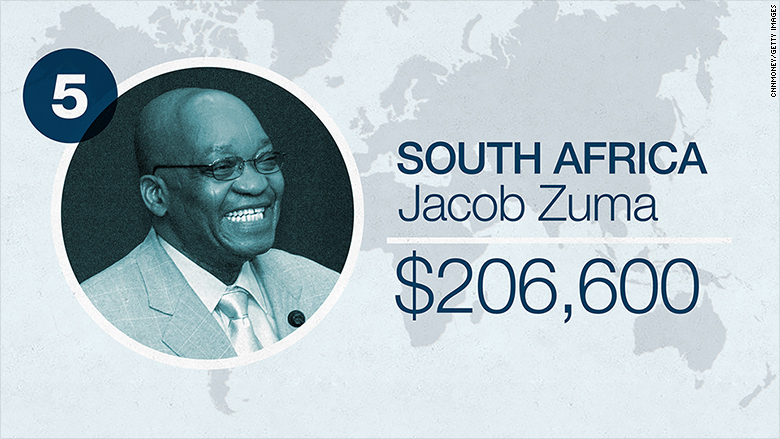 South Africa's leader Jacob Zuma got a 4% raise in March, but his salary in dollar terms has actually dropped compared to last year, because of the fall in the south African rand. The French president would have ranked much higher had he not taken a 30% pay cut on assuming office in 2012. 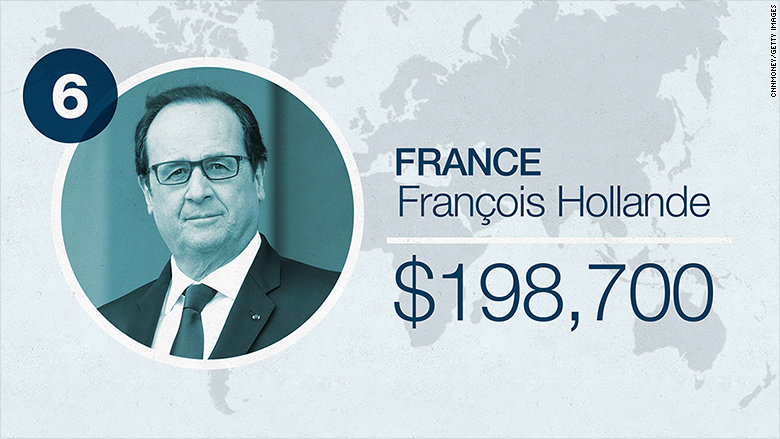 Without the cut, Hollande would have earned 255,600 euros a year ($274,522), second only to Obama. Now he makes $198,700. 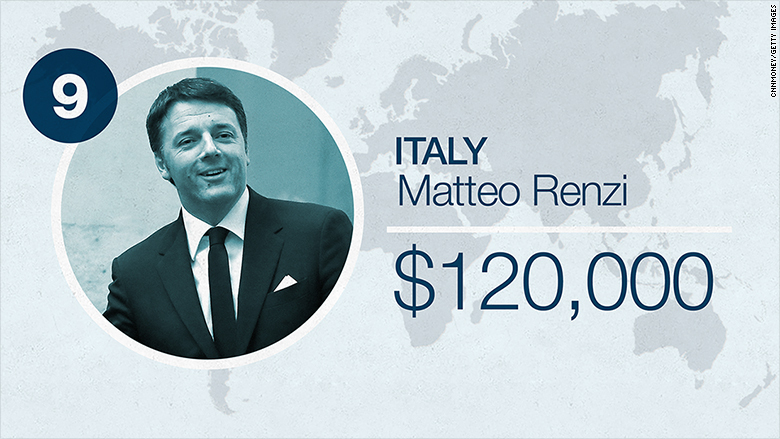 Famously, his personal hairdresser makes $132,000 a year. 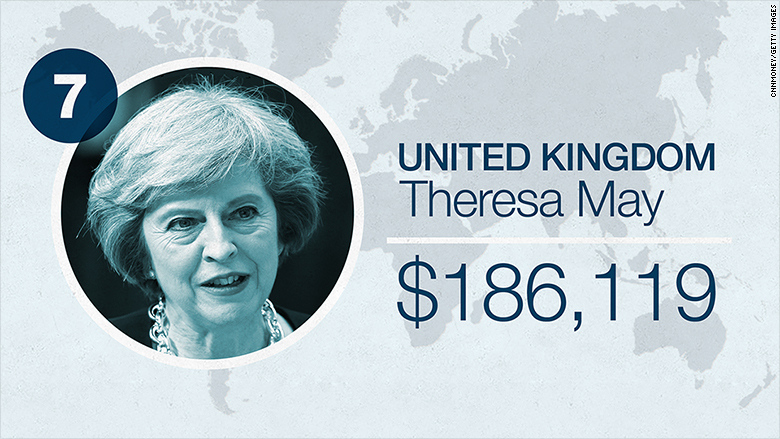 Theresa May, the new British prime minister, earns 143,462 pounds ($186,119) a year. 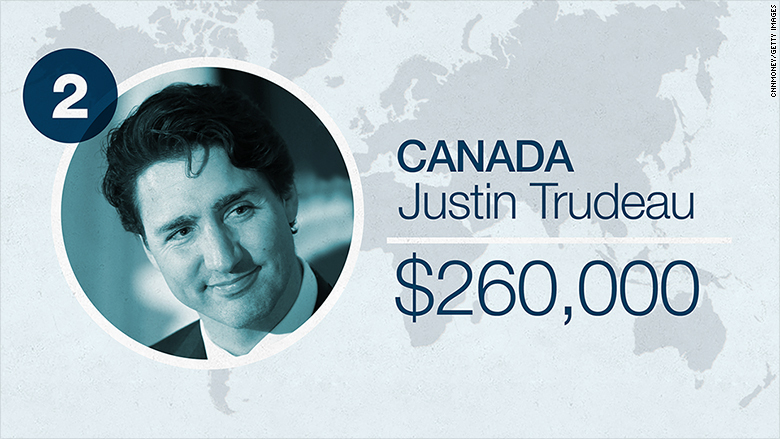 That includes her salary as a member of parliament, which is 74,962 pounds ($97,256) a year. Unfortunately for May, the big drop in the pound since the Brexit vote means her salary has plunged in dollar terms. Her predecessor David Cameron placed fifth in CNNMoney's previous ranking in March 2015 with his salary of £142,500, then worth $214,800. May is only seventh. 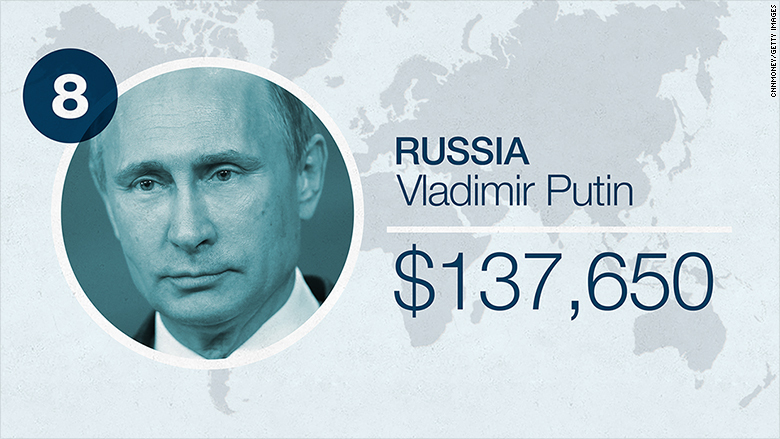 Russian President Vladimir Putin took a 10% pay cut last year, as his country sank into a deep recession. But that was after his salary more than doubled in April 2014, to roughly 9.7 million rubles. According to Putin's most recent income declaration, he earned roughly 8.9 million rubles ($137,000) in 2015. 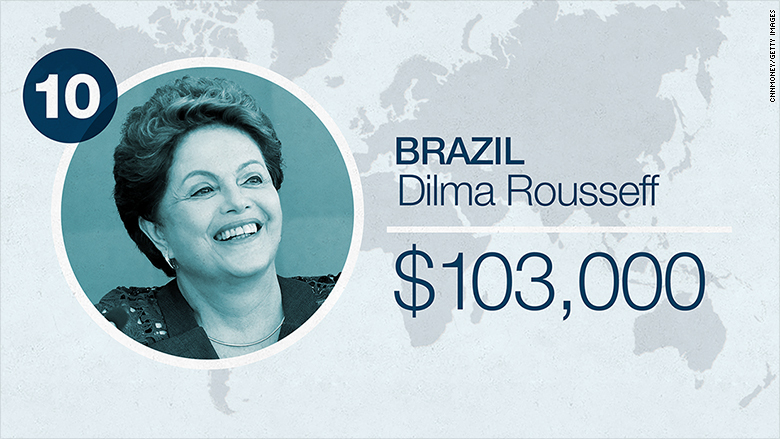 Brazil's President Dilma Rousseff, who is facing impeachment, slashed her own salary by 10% to $103,400 a year last October as part of a wider austerity drive. 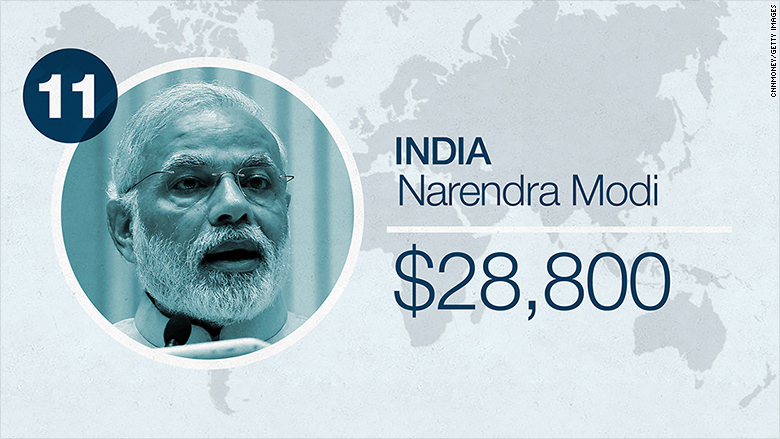 The Indian prime minister's salary is just 1,920,000 rupees a year, which comes to little over $28,800. That's according to an official response to a freedom of information request submitted by local media. 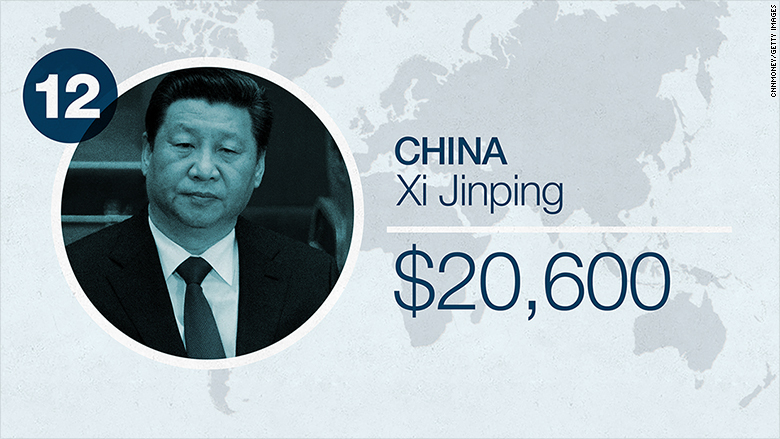 He may be in charge of the world's second largest economy, but Chinese President Xi Jinping's official salary was just $20,600 last year. And that's after a 60% pay rise he was given at the start of 2015.